The success of your team depends in part on integrating tools for seamless work and great results. 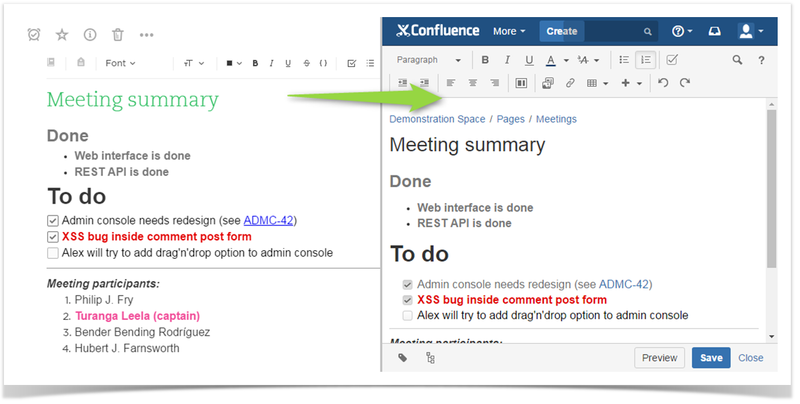 Many teams choose Atlassian Confluence to create and collaborate on documents and to organize and discuss teamwork in one place. 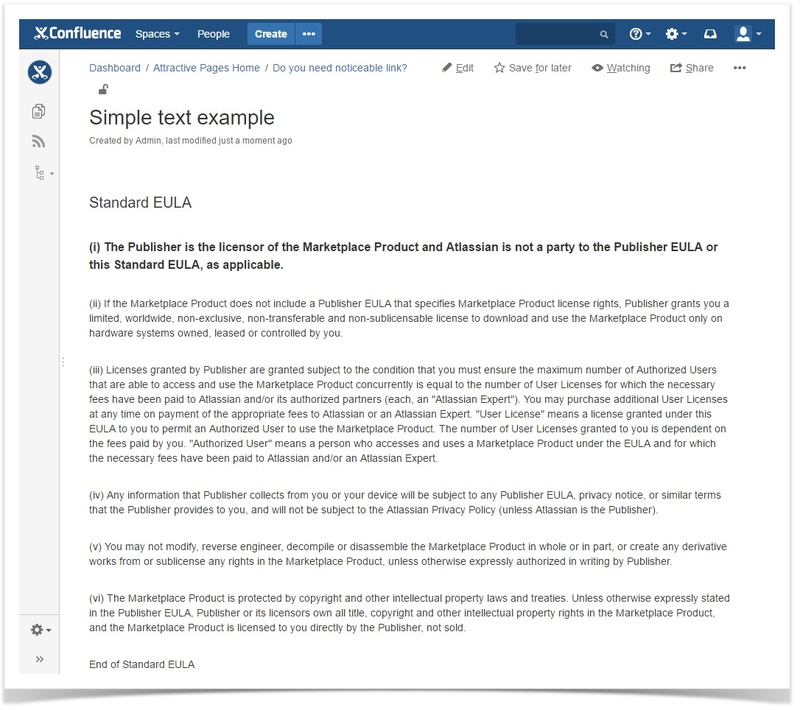 Confluence is used primarily on desktop computers and laptops. It’s not all that convenient to use a smartphone or tablet to work with this system, so when you’re offline without access to your Confluence site or online but away from your desk, you need another way to capture and store work-related data to share it with your colleagues in Confluence later. You may want to share a photo of a design sketch, notes taken in a client meeting, or a documentation draft written during a business trip. Evernote is a great solution because it allows you to create notes that have all kinds of content anywhere, anytime — even when you don’t have Internet access. 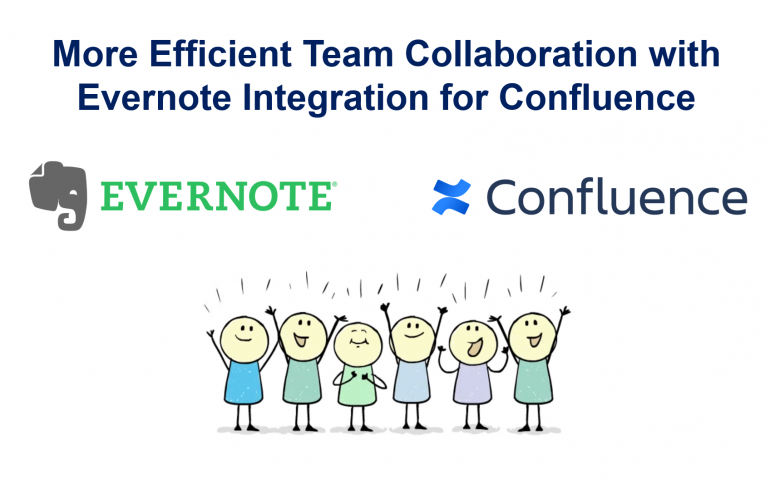 Using Confluence with Evernote makes team collaboration more flexible and efficient, and it helps everyone to be on the same page. To build a bridge between your Evernote account and Confluence site you can use Evernote Integration for Confluence. It’s an app that provides a simple and quick way to copy notes created in Evernote into Confluence to share them with your team. To get started, a Confluence administrator needs to install Evernote Integration for Confluence (it’s available in the Atlassian Marketplace). 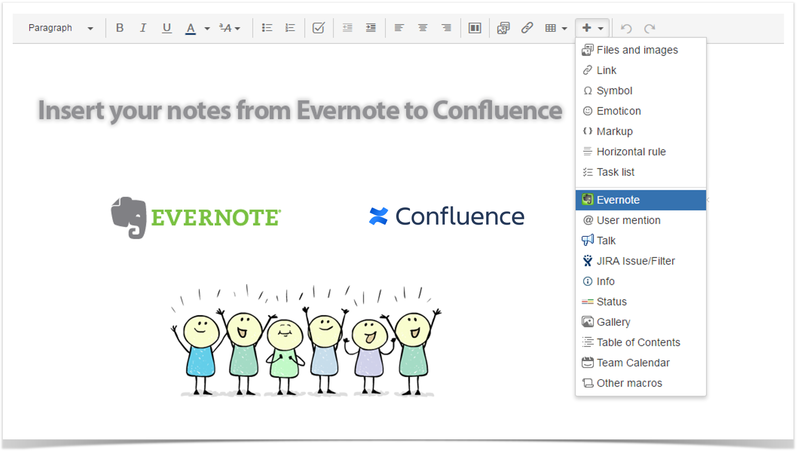 Then each Confluence user who wants to use the integration should connect to Evernote. 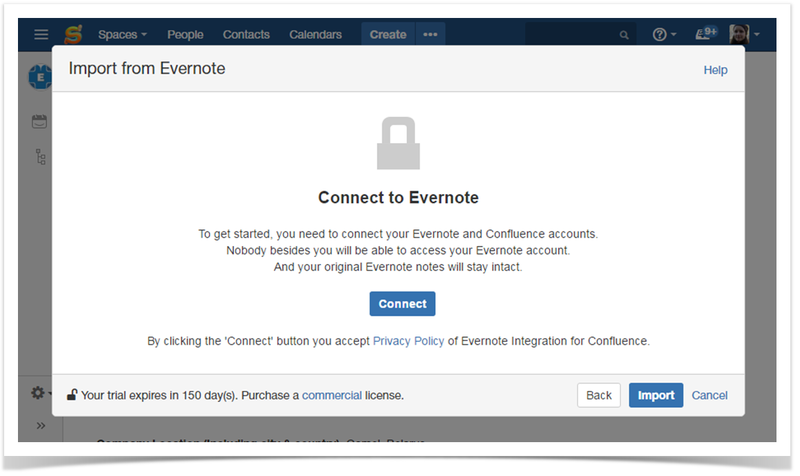 Once Atlassian Confluence is authorized to access your Evernote account, you’re good to go and can start importing notes. 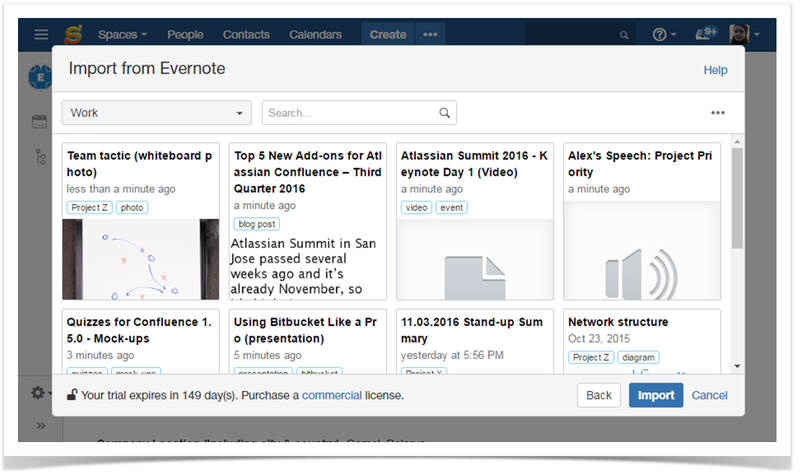 If you are not using Confluence yet, you can get a 30-day free trial. Evernote Integration for Confluence allows you to share copies of Evernote notes on Confluence pages. You can import notes into existing pages or use a blueprint to create a new page with the notes you choose. Shared notes become part of the content of your Confluence site, and your colleagues can contribute to what you’ve shared or use that data for completing their own tasks. While your teammates can view and edit copies of the notes you share with them, original notes stay intact in your Evernote account. The filtering, sorting, and searching capabilities of the integration make it easy to find notes you want to import. If your note contains to-do lists, emoticons, or formatted text, they’ll be preserved while being copied into Confluence, so you won’t have to redo your work. Visit App Center for more information on the integration, or start your free trial today.